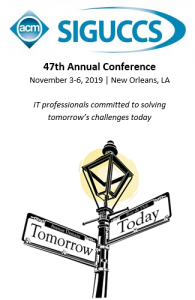 The ACM 2019 SIGUCCS annual conference will begin on Sunday, November 3 with several pre conference events. After you attend an in-depth Preconference Seminar, join the opening Welcome Reception. The conference brings together directors, managers, communicators, and support personnel who are empowered with finding ways to support new technologies, and bring together new techniques, ideas, and insights. Discussing technologies, methods and reflections with equals is a great way to generate ideas and solutions that can be carried home to higher management. Are you interested in presenting at ACM 2019 SIGUCCS Annual Conference? The Call for Proposals is now open and deadline for submissions is March 8th. Learn more about the submission process.